Speaking of Keenspot: Thomas Fischbach, creator of the Ursa Major Award winning on-line comic Twokinds, brings us into the creation of his realm with the release of The Art and Evolution of Twokinds — newly available in hardcover. 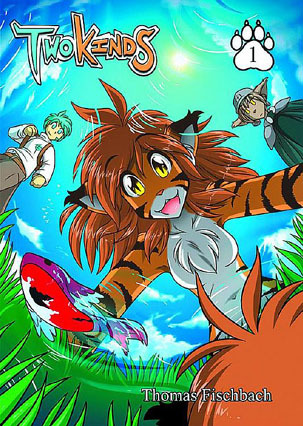 “Deluxe full color hardcover artbook exploring the art and evolution of Twokinds, the wildly popular webcomic following the adventures of a lone mage with no memory of his past and the beautiful tiger girl that captures his heart.” Nearly 100 pages in full color. Be warned though: Keenspot says they’re going fast!